No matter what part of the Comic Book industry you are hoping to break into, there is always one piece of advice that I hear from Comic Book professionals more than anything else. "In order to create Comics, you need to be reading Comics". I think its probably the truest piece of advice out there. When writing, drawing or colouring a book I try to absorb as much as I can from creators I admire. So for this article I am going to take a look at some of my favourite Comic Books that I am currently reading and more importantly, learning from. Head Lopper follows the blood soaked exploits of the warrior Norgal and his unlikely traveling companion the severed head of Agatha the Blue Witch. Its publication history is that of an Indie book done good. Originally MacLean self published the title, until it was picked up by Image Comics in 2015. Head Lopper is a very unique entry into the Sword & Sorcery genre. MacLean's art style might fool the reader at first with its cartoon like line, but once you sink your eyeballs deeper into the book it reveals itself to be an intriguing tale, dripping with as much dark humour and mystery as it is with gore and violence. MacLean's story telling is top notch. You can't help but be drawn into Norgal and Agatha's adventures as they make their way through the Island realm of Barra, This is a fantasy world that arrives fully formed, containing as much intrigue and wonder as it does giant sea creatures, monstrous wolves. wood elves and giant spectres, seriously this book has sword wielding ghost giants and they look awesome. MacLean's creature design is a thing of beauty, it goes from images constructed with just a few pen strokes, to highly detailed rendering accompanied by Mike Spicers brilliant job on colours. The palette of Head Lopper sells the world to you. For me as a reader there is a distinct 70/80s Dungeons and Dragons feel to the way the book is coloured, now this may be my own skewed idea of Sword & Sorcery stories feeding into how I perceive the books, but when I looked at panels like the one below, my mind immediately jumped back to hours spent dungeon crawling in DnD, or to an episode of He-Man and the Masters of the Universe. I have only read the first volume of Head Lopper, the second volume is at the very top future reading list. I am excited to get to it for many reasons, the foremost of which is the fact the Queen of Colours Jordie Bellaire steps in as colourist for the second arc. As a creator, reading this book has shown me a lot about story telling, and how a page flows in order to move the narrative forward. This is a book of all killer no filler, with each page as important as the one that has come before it. Even when there are quiet moments with Norgal and Agatha seated around a campfire, or in Agatha's case resting her neck stump on a log, there is something to absorb. Head Lopper is currently available in two Graphic Novel Volumes at your local Comic Book store. I urge you to go and pick them up. Its one of those Comic Books that you want to tell everyone about. Redlands is a book that serves up something I think is lacking in Comics as a whole, Pure Horror done right. From the creative team of Jordie Bellaire and Vanessa Del Ray. It is a tale of witchcraft and mystery set in a small town in Florida. From its opening salvo, that harkens back to John Carpenter's Assault on Precinct 13, but with a supernatural twist I was all in. This book literally casts a spell on you as a reader. Vanessa's artwork is free flowing and alive, and suits this type of tale perfectly. Its also bolstered even further with Jordie's colour work. 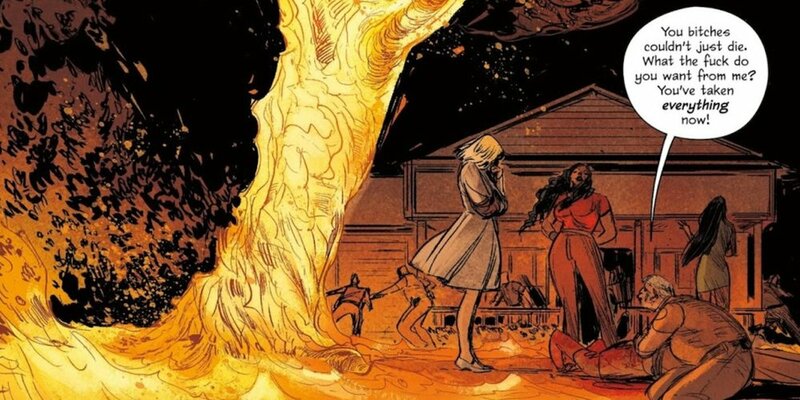 The first issue builds to a finale that sets the scene for the series as a whole, and leaves you wanting to know where this story is going to go. As the story unfolds we get to delve deeper into the world of Redlands, and it is a world steeped in folklore, murder and magic. Each issue of this series offers something different that complements the story arc as a whole. There are nods and links to real life, with one plot thread tipping its hat to the Zodiac killer, while in the same breath the tale of one character delves into the lore of the Florida swamps. Redlands is a rich tapestry of storytelling, well crafted and beautifully put together by its creative team. Something I learned from this book is that when you are writing horror that you hope will chill the reader you need to focus on the pacing and panel layout, and not to just blast the reader with image after image of in your face gore. More can be achieved with just a suggestion that something is amiss, building the moment slowly before the final reveal for greater impact. I am currently writing two separate books that contain strong horror elements and on more than one occasion after reading an issue of Redlands I have had moments of clarity when it came to storytelling that have enabled me to write pages in a new light that really help push the narrative forward. This is the importance of reading as many Comic Books as possible. In the same vein of the Glengarry Glen Ross' well known phrase "Always be selling" If you are an aspiring creator like myself you should "Always be reading"
Redlands at its core is a solid character driven story. Its core group are an intriguing complex coven of diversity, and that in itself is something that every creator needs to pay attention to. The ability to be able to write believable characters that speak to a wide variety of audience is something that doesn't always land for some. Redlands is pretty much the guide on how to achieve this across artwork, colour and writing. I would be remiss in not mentioning the the amount of work that went into the additional material in the back of each issue. Fakes Articles, adverts and profiles that help build the idea of the world that the story is taking place in. Another aspect to creating a book that just wraps its arms around the reader and drags them in. Each of the first six issues are adorned with hauntingly beautiful covers that all seem part of a larger spell. The covers are gorgeous in he own individual way, but viewed together they create a sort of visual portmanteau of horror that both intrigues and disturbs in equal measure. Redlands Volume 1 is published by IMAGE Comics and is available now from your local Comic Book store. I highly recommend checking this book out. Its a beaut of a book. If you had told me a year ago that a book about Mister Miracle was coming out that would have me tearing up with equal parts joy and sadness I would've told you, you were a crazy person, but here we are, eight issues into King and Gerad's run on this wondrous take on Jack Kirby's NEW GODS and I am completely hooked. This book is unreal. I will admit that i was late to the party on this one, but thanks to my local Comic Book store heroes at Dublin City Comics i was able to gather all of the first six issue run together and absorb its majesty into my eyeballs in one fell swoop. There are many things about this book that I adore. It has some of the best written characters in Comics. The storytelling from both writer and artist is second to none. 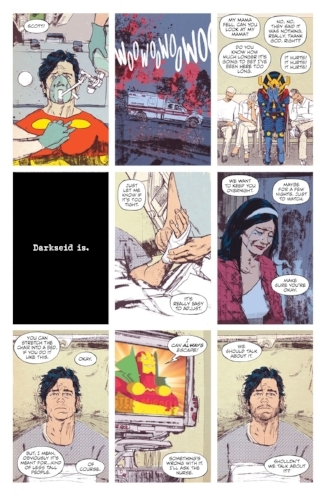 Moments of destruction and violence are punctuated with moments of comedic gold, but if there was one thing that I gleaned from Mister Miracle its the correct use and layout of the page to tell a story, and tell it well. Bar the first three pages, which give readers a recap of who Mister Miracle is. Each page of the book is broken down into nine panel grid, but this doesn't constrict the storytelling in any way. In fact personally I thinks its as much as part of the plot as every other aspect of this book. This storytelling technique has inspired me in such a way that I have written sequence based on its style in the upcoming book A Town Called Killed as a homage. 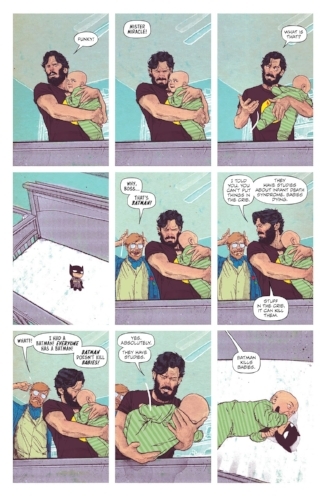 King and Gerads have created beautifully unique book in every aspect with Mister Miracle. They humanise the central cast beautifully, showing sides of the idea of a Superhero that we don't often see. These are put in juxtaposition to moments of bombastic action and violence that occur within a page of each other. Every details of this book matters, prompting the reader to revisit pages they've just read in order to make sure you did actually read what you just read. They also portray one of DCs major villains in a way that makes he seem more powerful and bogeyman like that he has ever been portrayed before, so much so that he has only appeared in one panel so far in the eight issue run and that panel was enough to make me have a sharp intake of breath when it happens. The story is still unfolding, and is currently at its eight issue, with issue nine due next week. So far it has shown Scott Free aka Mister miracle to be a man divided on many fronts. The creative team's combined abilities to show so many aspects of one character is fantastic and something that anyone hoping to create their own books should pay close attention to. The story of mister miracle is multifaceted and is also filled with mystery about where Scott's loyalties and life will take him and those he holds most dear. on a personal note it also deals with the arrival of his and Big Barda's child and how he is dealing with fatherhood. I've just become a father myself and when you can feel a personal connection to a book at that level it obviously increases the enjoyment and the investment you're going to give it. Mister miracle is a rare book from DC comics, in so far as its both a big bombastic superhero story and an extremely personal one as well. it has bit of everything contained within its pages. the teaming of King and Gerads has proven to be a match made in heaven. Volume one collects issues one to six of this series and is available now from your local Comic Book store , with the series being published ongoing every month. Thats it for now, I could go on an on about numerous other titles I am currently reading, but I will save them for a future Rogue Comics blog post. If you want to find me on social media links to my twitter and Instagram feeds are listed below. If you want to check out some of my current work you can find The Broker in the Rogue Comics store. Thanks for reading folks.